Every V2 e cigarette or V2 PRO Vaporizer has a battery that is used to heat up the e liquid (containing pharmaceutical grade nicotine and water) contained in the cartridge or tank. The e liquid is vaporized and this allows inhalation and simulates the "smoking experience" to help reduce nicotine cravings. The batteries are rechargeable and the cartridges are either disposable or refillable up to 10-40 times [we sell various types of prefilled or refillable e cigarette cartridges and tanks]. Each disposable cartridge [i.e. V2 Classic] is approx. 20 cigarettes and costs less than £1.95 - that is a packet of 20 cigarettes is almost 4 times the price - can you remember when a pack of 20 was £2.00? EX Series Cartridges last even longer (up to twice as long) and save you even more money. If you like to use e liquid to refill the tank yourself then use EX Blanks or a V2 PRO Vaporizer which can be refilled and reused a number of times. If you have any questions phone our support line on 01733 555 555 for help and advice. Also, have a look at our blog article about vaping at work. Note: A standard tobacco cigarette has about 6-7 puffs, your e cigarette will last a lot longer. Use your V2 e cigarette in the same way as a tobacco cigarette - don't hang on to it for 15 or 20 minutes - the battery will last a long time if used like a normal cigarette. Take a few puffs and then take a little break. The first step is to open the box. Although some kits differ, all V2 kits include at least one V2 battery, a charger, a pack of V2 atomizers/flavour cartridges or an empty tank, and an owner’s manual or user guide. We recommend that you read through your owner’s manual thoroughly before using your V2. If you can any questions then please contact customer services online or via telephone to ensure you start off correctly. It can very frustrating buying a new "gadget" and then not being able to use it effectively right away, s if you need help please ask ! Before using your V2 e cigarette or vaporizer for the first time, we recommended that you fully charge the battery/device. To charge the battery, simply screw the battery into the USB adapter (or attach the magnetic charging cable), then plug the USB adapter into a computer's USB port (or into the included USB to Wall adapter). When charging, the LED light on the charger will glow red or flash depending on the model. Your V2 is fully charged when the LED on the charger glows blue or green. A V2 Classic or Ex Series battery can last up to one week on a full charge depending on how many puffs you take per day. Unpack a V2 Classis or EX Series flavour cartridge and pick off the rubber stay-fresh caps. 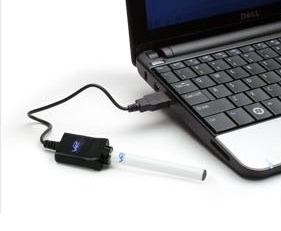 Screw the cartridge securely onto your electronic cigarette battery. 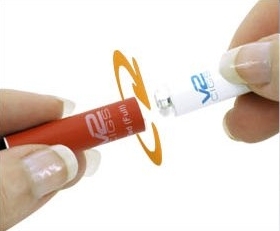 Your V2 e cigarette will enter standby mode as soon as you screw in the cartridge. Your V2 is now ready to use! Kick start each new cartridge by taking a few strong puffs in rapid succession. This action will warm the liquid and prime the heating element producing a thick consistent vapour with each subsequent puff. As you press V2 to your lips and inhale, the LED light at the tip will glow just like the tip of a burning cigarette. Relax and enjoy the rich smooth V2 vapour. 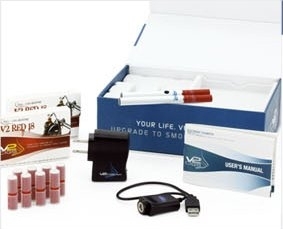 V2 electronic cigarettes are comprised of two primary components, the flavour cartridge and the battery. V2 vapour cartridges contain our proprietary solution of nicotine (or non-nicotine), water, flavourings and propylene glycol (an FDA approved inhalant and food additive). The cartridges contain built in atomisers, so there is little cleaning or maintenance required, unlike many electronic cigarettes on the market today. All you should need to do is wipe around the top of the battery with a clean tissue everytime you change the cartridge. V2 e cigarette kits are shipped with our Classic/Standard automatic batteries or EX Series batteries, which are designed to offer a perfect balance between physical weight and vaping/smoking time between recharges. To use your V2 electronic cigarette, simply screw a flavour cartridge on to the end of the battery and puff on it like you would a normal tobacco cigarette. When you draw air through the V2 cartridge, the heating element will automatically activate and produce inhalable vapour containing your chosen strength of nicotine and selected flavouring compounds. Every V2 Classic flavour cartridge is filled with enough of our proprietary vapour e liquid to produce between 150 - 220 puffs (dependent upon deepness of puffs). Each Classic cartridge is roughly equivalent to a traditional pack of tobacco cigarettes. You'll know when a cartridge is used up when the flavour becomes weak and has a burnt taste. Cartridges are disposable and can be discarded after use. Just screw off the old cartridge and screw on a fresh one—it's that simple! When the battery requires charging it will blink intermittently. Standard V2 Automatic Batteries can last from 2 days to a week before they require recharging ( this is dependent upon your smoking frequency and puffing style). The battery can be fully charged in 2-3 hours. Tip: smoking a V2 electronic cigarette is a little different than using an old fashioned ignitable cigarette. To adjust the vapour thickness, you may want to prime the e cigarette. To do this, give it a few strong puffs in rapid succession before puffing normally. This action will heat up the vapour e liquid a little bit more so it becomes warmer and this will create thicker/richer vapour in subsequent puffs. Tip: When you first begin using electronic cigarettes, you may want to start with a light strength or a mix of strengths. Some people find the full strength nicotine cartridges or e liquid to be too strong. It often produces better results if you start vaping with a lower strength e liquid and increase the number of puffs until you feel satisfied. Tip: A great accessory you may want to consider is a V2 Manual Battery or a V2 PRO Vaporizer. Unlike the automatic batteries which activate by puffing, the manual batteries and vaporizers have buttons installed on the body of the e-cigarette or device allowing the vaper much more control of the vaping experience. It is really a matter of personal preference; for every person that prefers a manual battery or vaporizer with a button to operate it, you will likely find two people that prefer the automatic option because of it's ease and simplicity. As a general rule, automatic batteries are a little easier to use, and certainly better for multi-tasking. Tip: Flavour, strength & taste are very important decisions when you start to vape, as important as the vape device you choose. If you don't get the choice right first time it is important to continue and not to get frustrated and give up. Try alternating between tobacco, fruity and sweet flavours at different times of the day. You might find that a menthol or minty e liquid goes great with your cup of coffee in the morning but not with your cup of tea in the afternoon! Try a mix of nicotine strengths to see which one helps reduce your cravings best. Also, it's Ok to mix smoking and vaping (known as dual use). There is nothing wrong with having a cigarette in the morning and then vaping for the rest of day. You don't need to stop smoking right away, we know it is very difficult to quit smoking, and for many smokers to quit, it takes a Herculean effort. You are on a journey away from smoking & we want to help you get there. Stay off the Marlboro Reds and don't give those tobacco companies any more of your money !